Of course, the New York Yankees are a team of NYC. The residents of the Bronx feel just a bit differently. Perhaps it’s because of the location of Yankee Stadium. The stadium being in the Bronx has emboldened the natives of the Bronx to feel like the Yankees are their own. Knowing the history of the Yankees and the Bronx helps. With a team as big as the Yankees, it’s easy to hate or love them. Hopefully a little history on the Yankees and the Bronx can assist you. The Yankees are possibly the most famous baseball team of all time. They consistently play at professional levels, which can’t always be said about major league baseball teams. With 27 World Series Championships, 40 AL Pennants and 18 division titles they’re without a doubt a force to be reckoned with. While some New Yorkers and even residents of the Bronx dislike some administrative decisions as well as player actions, the team is a shining piece of the city’s culture. The admiration is completely warranted, with over forty Yankees players being inducted to the National Baseball Hall of Fame. Of course, Babe Ruth and Lou Gehrig being two of them. Not many teams can tout the talent that has traveled through the Yankees. Plenty of stories stem from the team that are held in a golden historical pretense. It’s fascinating to read some of them. 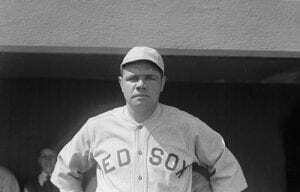 Babe Ruth’s notorious point and hit is one worth reading if you never have. To get back to the Bronx however, one must only look at the former nicknames of the Yankees. One most commonly used to describe the team is the Bronx Bombers. 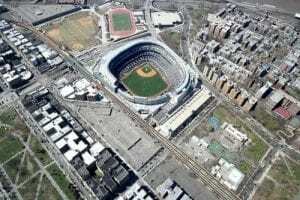 Yankee Stadium was built at 1 east 161st Street and replaced fairly recently in 2009. It’s the most expensive stadium ever built, that didn’t come without controversy. Replacing the 1923 Yankee Stadium and its updated version in 1976, tax payers weren’t excited about how much it cost and how large it was. An interesting part of the facilities construction is the fiber optic cable to future proof all streaming and filming over the net that takes place at the stadium for many years. After all, most of the United States is only just now getting fiber optic internet wiring. The Bronx still welcomed the stadium, but others weren’t so inviting. It’s been criticized as being streamlined aeronautically for the purposes of increasing the frequency of home runs. Studies were done, to the humor of the Bronx’s residents. They triumphed their team and were correct. No conclusive evidence was provided to explain a physiological reason behind the stadium’s number of home runs. Perhaps it’s just the strength of the Bronx? We here are at Moishe’s would like to think so. If you’re a fan of the Yankees, or the Bronx in general and you’re moving here we can make it easier. The greatest team in baseball is not the only greatest team in the city. The Bronx is also home to the greatest moving team in the country. Contact us, visit our walk-in locations in the Bronx or Queens, or give us a call at (800) 536-6564.